Rental Air Handlers consists of a cooling coil and a fan enclosed on wheels, when connected to a hot water water source with temporary hoses they can provide temporary emergency cooling to your facility space right away. These air handler rentals can be hooked-up to one of La Brea Air’s hot water generators or your existing hot water system to provide instantaneous heating to your cold spaces. Our experienced “sales-engineers” can assist you in sizing your heating loads and help you select the appropriate rental equipment and determine the best way to meet your needs. These versatile small air handlers rentals mounted on heavy duty wheeled frames that can be easily rolled into place. They are perfect for smaller spaces up to about 2,000 square feet. They can be used along with one of La Brea Air’s small Chillers or to your existing building hot water system to provide temporary heat during shutdowns, maintenance, equipment replacement or even events, tents, class rooms, auditoriums or for your on location film shoots. They can be wired electrically for either 120, 208 or 230 volts of 1 phase power. A reasonable amount of accessories such as: flexible duct work, cam-lock hose and electrical power cables come with each unit. Normal setups typically can be up and running in less than a day including delivery to the greater Los Angles area. 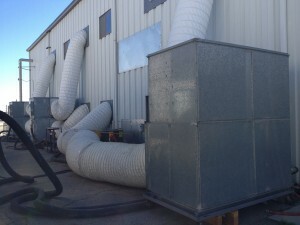 These medium air handler rentals are also mounted on heavy duty wheeled frames that can be easily rolled into place. They are perfect for larger spaces from 5,000 – 10,000 square feet. Use these air handlers with one of La Brea’s Hot Water Generators or your building hot water system to provide temporary heating during large shutdowns, maintenance, equipment replacement events, event tents and for your on location film shoots. They can be wired electrically for either 208, 230, 460 volts of either 1 or 3 phase power. . A reasonable amount of accessories such as: flexible duct work, cam-lock hose and electrical power cables come with each unit. Normal setups typically can be up and running in less than a day including delivery to the greater Los Angeles area. Any one of our experienced “sales-engineers” can assist you in selecting the best air handler and hot water generator to WARM up your COLD spaces and and help you evaluate the best way to meet your needs. 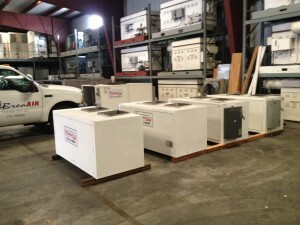 These large air handler rentals are also mounted heavy duty wheeled frames that can be easily rolled into place. They are perfect for larger spaces from 15,000 up to about 20,000 square feet. They can be used along with one of La Brea Air’s hot water generators or your building hot water system to provide temporary heat for large building shutdowns, maintenance events, equipment replacement , warehouse cooling, large parties, special events or for your “on location” film shoots. These larger units can be trailered into place and have you warmed up today. They can be wired electrically for either 208/230 or 460 volts of 3 phase power. A reasonable amount of accessories such as: flexible duct work, cam-lock hose and electrical power cables come with each unit. Air handler rental setups typically can be up and running in less than a day including delivery to the greater Los Angeles area.